After a long search we booked the POHO hotel in Weggis for our last part of the trip. We arrived yesterday in the afternoon and after checking in and testing the hotel’s swimming pool we had dinner at the hotel’s Asian Dining Lounge. We booked the Lazy Days @ POHO package with a 3-night stay in a lakeside superior room, breakfast and parking included, one 3-course dinner and a boat ride. The hotel is in a great location directly on the promenade so parking was necessary. The breakfast is usually not included in the room’s price and it is very expensive (this is probably the reason why it was so empty this morning) so we were happy to receive it in the offer with this package. The boat ride was a nice bonus and I was really looking forward to it. The hotel and the room is very modern. We even have a Playstation 3 in our room and we got a Nano Router at the reception so that we have WIFI in the room. The spa is nice with a small swimming pool, sauna and relax area. There is even a gym with all kinds of weight training and cardio machines. The breakfast is served in the Asian Dining Lounge, where we dined last night, and there is everything that I could possibly imagine having for breakfast. Sure, it is expensive if it is not included but I am very satisfied with the wide selection. We got up early this morning and had a great breakfast at the hotel. We booked the boat ride with the Super Sunliner 240 at 11 o’clock so we headed across the street to the marina where we met the captain. 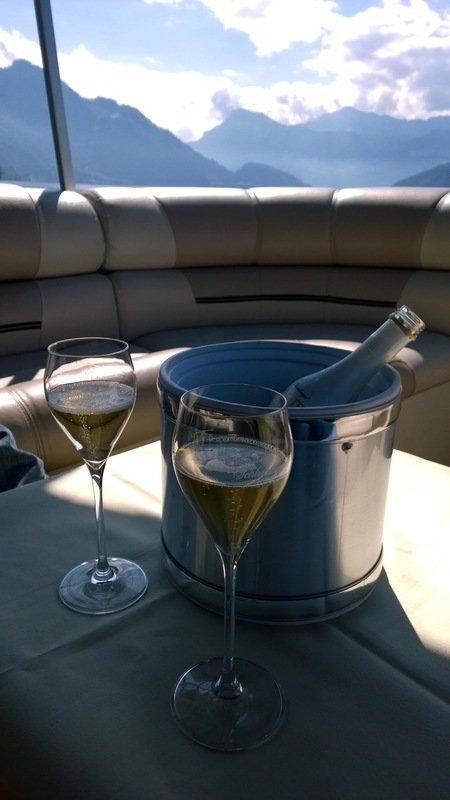 We boarded the Sunliner and were served with champagne as we slowly started going out on the lake. 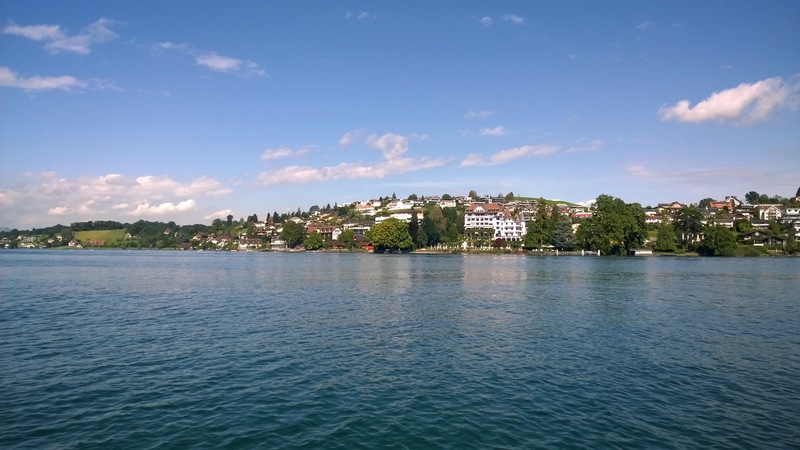 We did a big round on the Lucerne lake and the captain explained us the mountains and the villages on the way. 30 minutes later we were parking the boat back at the hotel and got ready for hiking. We did two downhill hiking trails in Zermatt so we decided to hike uphill to Rigi today to give our calves a break. We followed the Mark Twain Trail, also described in the book “Climbing the Mt. Rigi” by Mark Twain himself. The path took us through the village towards the hill where it alternated between the road and the hiking trail passing through fields with trees and flowers as a shortcut to the next street. 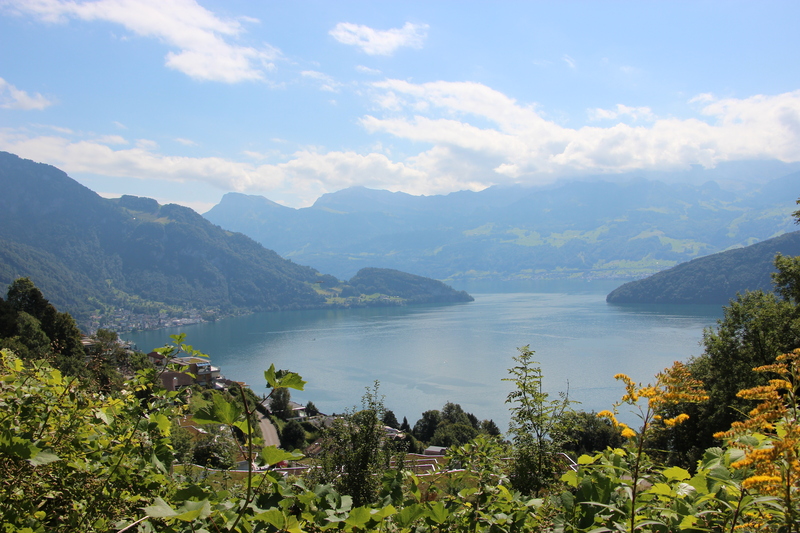 The trail was wide enough and easy to climb and we stopped often to admire the view to the Lucerne lake. The path got slowly difficult as we got to the rocky mountain and we passed through the forest with waterfalls and creeks on both sides. We had a short break at Felsentor, where a beautiful house greeted us with a terrace, called the Stiftung Felsentor. This place is a charity but retreats are often organized here for yoga, zen, meditation and lots more. We took a short break on the self-service terrace and had a drink which we paid with donation to the charity. There is nobody serving on this terrace and basically you can get your own drink and put the money in the box. If you don’t have change you can even wire the money, the charity simply believes in the good of mankind and trusts the hikers passing by and making a stop there that they will pay for what they consume. The last part of the trail was very steep to climb and we stopped very often to rest. We were so so happy to finally arrive to Rigi Kaltbad. We climbed the queen of mountains! We didn’t have unfortunately our bathing suits because there is an awesome spa Mineralbad & Spa Rigi Kaltbad which I absolutely recommend. There are also plenty of hotels in Rigi Kaltbad and a train goes up there so staying in Rigi Kaltbad is also a good option. We were hiking for 4 hours already, it was passed 16 o’clock, the dark clouds were gathering on the sky and we were tired so we decided against continuing the hike to the top of Rigi which is the most difficult part and it would have taken us another hour or so. We made a break and had a coffee, a cake and an ice cream and finally took the cable car back to Weggis. We walked along the promenade in Weggis and looked at the restaurants along the way to see where to go for dinner in the evening. After relaxing a bit in the hotel’s pool, we headed to the nearby POHO Lake Terrace here in front of the hotel. The weather was gorgeous all day long but a strong wind was blowing by the time we got there. 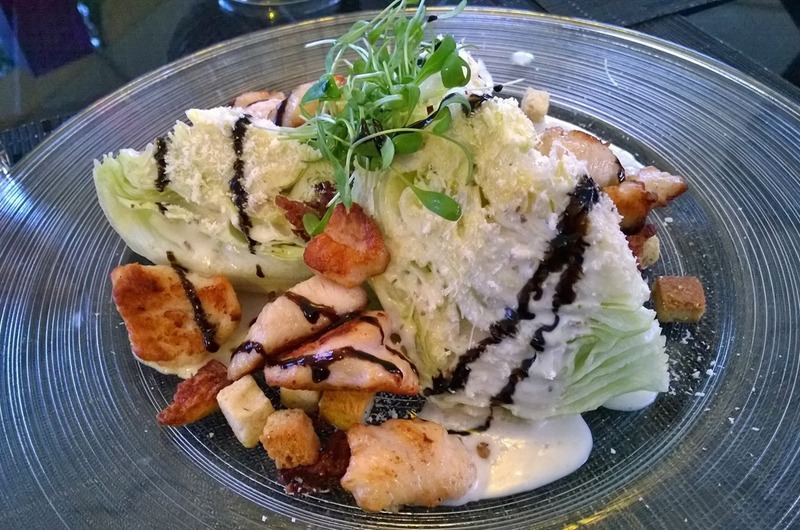 We luckily had our wind jackets on but it was pretty challenging to eat our Caesar salad nevertheless. 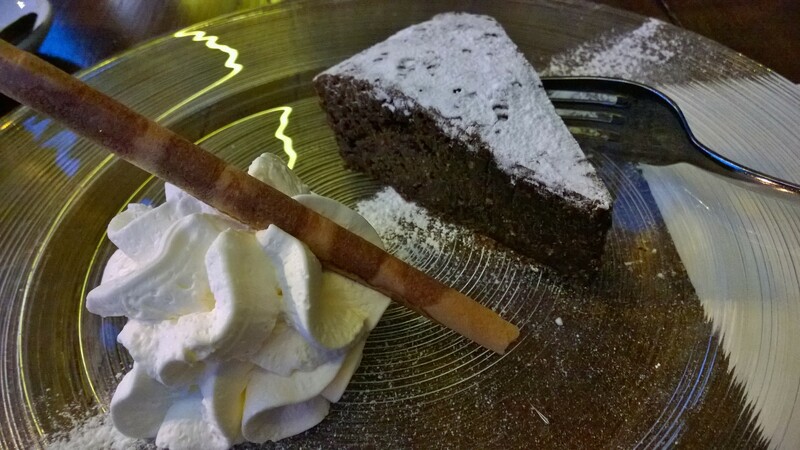 We moved to the POHO Weggiser Stübli for the dessert, I had an amazing warm homemade brownie and Jasmine tea. FitBit stats: 12.95 km, 18.657 steps, 322 floors.